I've been getting a lot of responses and emails lately about my Money Trees. If you are new here, I originally posted a tutorial on how to make them last Christmas. Since then, I've been getting questions and comments about them, they are being pinned on Pinterest, and lately, I'm even seeing them recreated. I love it. She involved her kiddos by having them draw a picture. Then Emily used that picture and placed in around the base of the tree. She did this instead of using fabric to cover the can. I think that is an awesome idea and I love that it incorporated the child's art work. Emily also came up with a poem that she included so the teachers would know what the gift was. I'm passing along the poem, with her permission, because I think others out there might be trying to come up with a teacher's gift and what Emily has done is really awesome. We thought of you as we folded each bill and put it in it's place. Cute right? 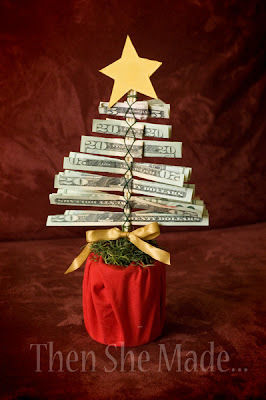 Emily also placed her tree inside of cellophane wrap to complete the look of the gift. She said the teachers loved it! Thank Emily for sharing your creation! 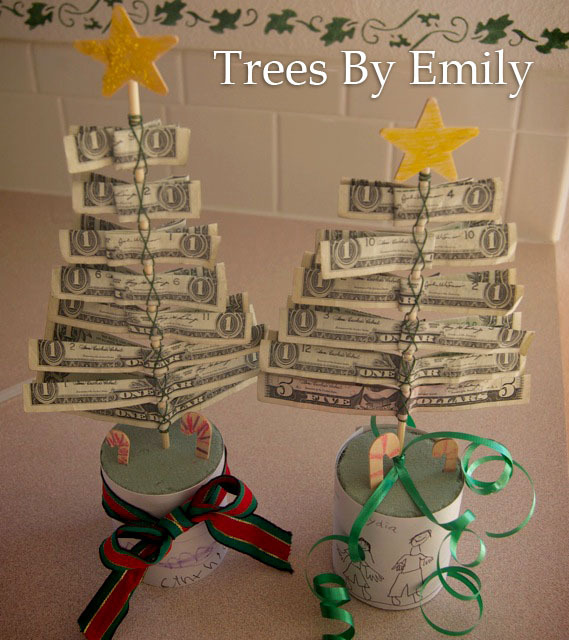 Money Tree 1 and Money Tree 2 They really do make fun gifts and add a unique twist on giving cash.